Medium Arm - Light Tone - SHIPS FREE! Medium Arm - Light Tone (Bulk pack 50 each) - SHIPS FREE! Large Arm - Light Tone with Gel Pad - SHIPS FREE! Large Arm - Light Tone - SHIPS FREE! Small Arm - Light Tone - SHIPS FREE! Medium Arm - Light Tone with Padded Arm - SHIPS FREE! Medium Arm - Dark Tone - SHIPS FREE! Small Arm - Dark Tone - SHIPS FREE! Posey Skin Sleeves Protector is ideal for patients with fragile skin that is prone to abrasions and tears. This is a non-compression sleeve that discreetly covers and protects the skin from tears and bruises. 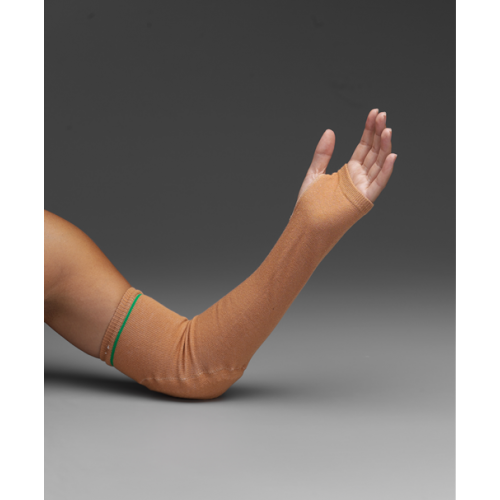 The Posey Dark or Light Tone Skin Sleeves prevent disruption of medical treatments by camouflaging wound sites and IV sites. It a protective barrier and is made from soft materials (nylon, cotton, spandex) that are knitted from four-way stretch yarn. 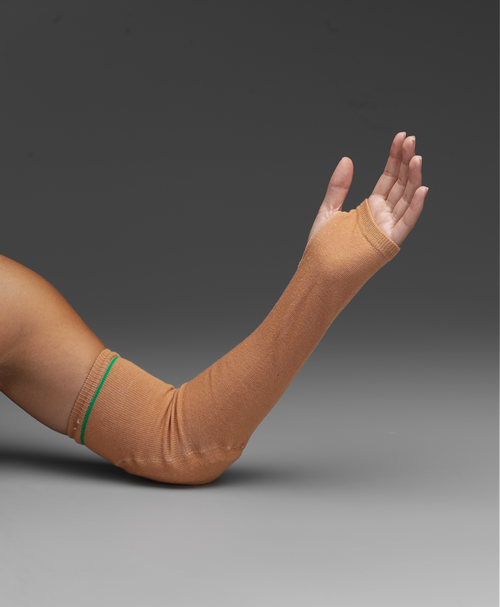 They are available with or without sewn in pressure absorbing pads positioned at the elbow. They are machine washable and available in two colors: light tone and dark town, which allows you to easily match the sleeve to your skin tone for maximum discretion. Posey also manufactures Leg SkinSleeves that protect the skin from the knee down. Very allergic to latex containing products, are these sleeves latex free. Where are the gel pads located in sleeves? Do you have pics of them? We have requested a photo of the gel pads from the manufacturer. We will update our product page when it becomes available. A long sleeve t-shirt or a tube sock works better! Don't bother. Buy a long sleeve t-shirt or cut some holes in a tube sock to create the glove. The fabric is the same material. This product didn't protect my mother's arms at all and they are not returnable once you open them. I ordered one pair of the posey skinsleeve protectors to try after tearing my skin down 4 layers and getting bruises with slightest touch against wall or table, etc. I was so thrilled by the protection I ordered a second pair and am having my 88 year old father order two pair to protect his arms as well. Great product. These sleeves have been very helpful in preventing skin tears for my 92 year-old mother. She says they are very comfortable and soft. They stay in place well, and have already been washed several times, yet look just like new. does exactly what it needs to do, covers the skin on the arm from slightly below the armpit/shoulder to over the wrist and top of the hand to the finger. The thumb hole is ample and comfortable, while the top cuff is as well. It does stretch out somewhat easily after a day or two of use, but washes easily, so I bought several to switch around in between laundry days. User friendly website, excellent products, fast, free delivery. Good protection for fragile skin. Would buy them again without hesitation. I bought these for an elderly person prone to skin tears because his skin is so fragile. He has fewer skin tears since he started using these sleeves a few months ago. They also provide some protection from drafts because he gets cold so easily. Great protection for your arms. My husband Richard loved to wear Posey Skinsleeves to protect his arms. Richard had Parkinson's disease and he had a tendacy to fall. By wearing the sleeves it helped ever so much to protect his arms. Fits well, protects even better. Since using wearing the sleeves my dad has not had a single skin tear.